Isaac Newton assured his place in scientific history by shaping our understanding of gravity. But even geniuses have bills to pay. And for quite some time, this was how Newton paid his. Sir Isaac Newton’s battle with the King of Counterfeiters, William Chaloner. Newton’s friends got him a plum job - Master of the Mint - where he was in charge of literally making money. He no longer had to live on a hundred pounds a year as a lecturer at Cambridge, which didn’t go far even in 1690. But counterfeiting was rampant in England, and was about to get vastly worse once the Bank of England started using paper money. Someone had to track down the people who were destroying the nation’s economy, and build airtight cases against them that would stand up in front of juries. The underworld didn’t think much of this bookish don, but had no idea how badass Newton could be when pushed. Elevator pitch: World’s greatest scientist gets medieval on actual British supervillains. Fascinating account by Thomas Levenson here: “Newton and the Counterfeiter”. 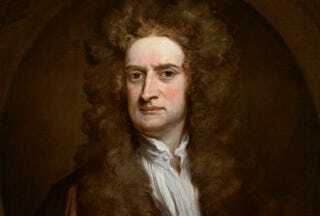 Curiously, Newton’s stint at the Royal Mint began well after the scientific and mathematical achievements that made him famous — he published his Principia Mathematica in 1687, and took his position at the Mint in 1696. Newton remained in office for the next 31 years, right up until the point of his death. Chaloner’s own career outside of the Mint ended in 1697, when he was arrested by Newton. Up until his death by hanging two years later, he continued to write Newton letters, which remained unanswered.